On Monday Sept 14th 2009, we celebrated the last ceremony for the Peace Mala International Awards for Youth at the UNA Wales Temple of Peace in Cardiff. The day was a glorious celebration of the wonderful peace work done by children and young people across the UK. For some time I have been considering a way forward that will be less competitive and more inclusive. My hope is that my new idea will encourage more schools, youth groups and communities to join the Peace Mala global family. Three exceptional primary schools agreed to pilot this new initiative during the past academic year. All have declared it an educational success. 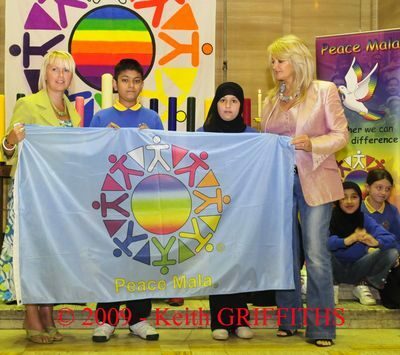 During the September Awards Ceremony at the UNA Wales Temple of Peace in Cardiff, these schools received the very first Peace Mala flags, indicating that they have qualified as Peace Mala Schools. Two of these schools also received equal first prize in the Junior Section of this year’s International Youth Awards. They are St Helen’s Primary School in Swansea, Wales UK and Hafod Primary School also from Swansea. The other qualifying Peace Mala School is Woodheys Primary School in Cheshire England. 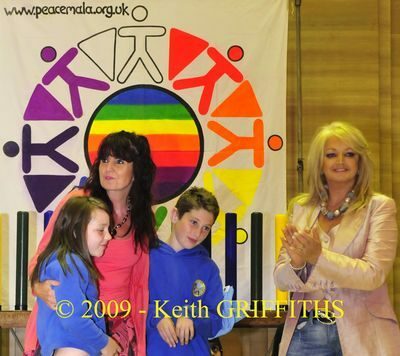 All three schools were presented with the very first Peace Mala flags by international rock star legend Bonnie Tyler who has been a supporter of Peace Mala for many years. 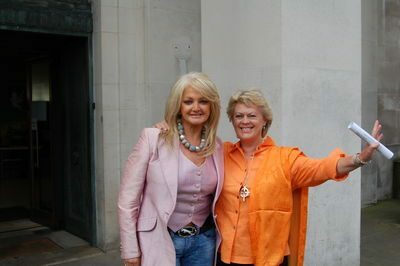 You can watch a ‘You Tube’ video of her at this year’s ceremony here. The Headteachers of all three schools are inspirational leaders who have encouraged their staff and the children they teach to levels of excellence. They are shining examples of what is needed in primary education today. I hope that more schools will follow their example. “Our school is a multicultural haven for the children of Hafod where we celebrate our differences and live in harmony. Our mission statement is ‘Learning, Laughing and Living Together’. We have introduced values education with our ‘value fairies and gold cabinet’. Each month we study a value and send ideas home to the families. We encourage our parents to work with us and the pupils on projects around the school. Peace Mala is central to what we do. “The project work that we have undertaken over the past three years has made a huge difference to our pupils, staff and parents. Women (mums and grandparents) feel more confident coming into school and are made to feel welcome. Relationships between staff and parents have improved and this has made an impact on the community. Children understand and display tolerance, respect, kindness, understanding, friendship, hope, honesty, peace and unity. Everyone feels included.” Visit the school website: Hafod Primary School. “St Helen’s is a successful multicultural school that serves an area of high deprivation in Swansea. There are 187 pupils on roll aged 3 to 11years. We currently have 13 different nationalities and 82% of our pupils use English as an additional language. “Our Peace Mala journey is a whole school one. St Helen’s shares the spirit and message of Peace Mala. We have 12 values devised by all our stakeholders – pupils, staff, parents and governors. Our school motto is ‘All different, All Equal’ and one of our aims is to create a safe and stimulating environment where all our children feel included and valued and learn respect and tolerance for other people. We are extremely proud of our diversity. Peace Mala has given us an avenue to engage with others. Support from the community and various groups have enriched our children’s experiences. We haven’t seen Peace Mala as a project; being a Peace Mala School is actually a reflection of what we are about and allows us to share common ideals and principles. Our children are our future. If they are instilled with sound values and equipped with the skills needed for lifelong learning, then we hope they will continue the journey for us.” Visit the school website: St Helen’s Primary School. “From the moment I laid eyes upon the Peace Mala bracelet, I knew that this was something very special, the missing link in education, the ‘glue’ that would bring together everything that we, as educators of tomorrow’s global citizens are striving for.” Visit the school website: Woodheys Primary School. There are seven key areas of action for Peace Mala Schools, Youth Groups and Community Groups. These areas fit in with the objectives and vision of Peace Mala. Peace Mala Review/Self Evaluation forms outlining the seven areas for action are now available on our website. The form should be completed by the school, youth group or community group applying for Peace Mala Accreditation and sent to us with their recorded results and evidence. Their review will identify progress towards achieving all or most targets in the seven areas of the action plan. This review form will be a self-evaluation form used as a template for teachers, youth leaders and community group leaders. 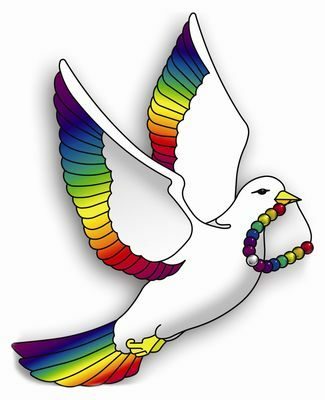 Once we are happy that the criteria have been met and evidence produced, the school, youth group or community group will receive a Peace Mala Award Certificate and be invited to apply for a Peace Mala Flag. A Peace Mala School, Youth Group or Community Group will be expected to share good practice with others who wish to join our global community. A school, youth group or community group can apply for re-assessment every three years.